KiwiRail Chief Executive Peter Reidy was one of 14 CEOs from leading businesses who came together last year to discuss how they could make a meaningful difference in climate change and help safeguard the country’s future. Alongside other top business leaders from around the country, Mr Reidy today signed the CEOs’ Climate Change Statement, the first step taken by the Climate Leaders Coalition in their drive for positive change. By signing the CEO Climate Change Statement, KiwiRail has committed to measuring and reporting its greenhouse gas emissions and working with suppliers to reduce emissions, with the aim of helping to keep global warming within two degrees, as specified in the Paris Agreement. “Rail, by its very nature, helps businesses hit their sustainability targets and New Zealand meet its commitment to carbon reduction,” says Reidy. “Rail has 66% fewer carbon emissions than heavy road freight per tonne of freight carried, takes more than a million trucks off the road each year, reduces congestion in our cities, results in fewer road injuries and fatalities and saves on road maintenance costs across the country. “If we could take 2.4 million trucks off the road by shifting more freight to rail, that would reduce New Zealand’s emissions by 518,000 tonnes annually. 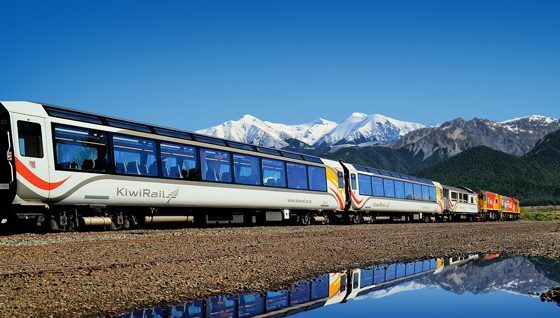 However KiwiRail, like all New Zealand businesses, can do more, Reidy maintains. “We’ve signed up to the CEO Climate Change Statement because we want to continue growing New Zealand’s economy in a sustainable way. “We want to know that our people will be looked after, and safeguard New Zealand for future generations. KiwiRail has already made a number of changes to reduce emissions, including through the ground-breaking Driver Advisory System (DAS). This technology has helped deliver fuel savings of 16 million litres, or $11 million, since 2015. Through its partnership with the Energy Efficiency and Conservation Authority, KiwiRail is looking to make similar savings on its Interislander ferry operations. “We will continue to drive programmes to reduce waste, cut our electricity usage and further improve the fuel efficiency of our locomotive and ship fleets,” Reidy promises. “We’re committed to continuing to help New Zealand move towards a low-emission future. “As New Zealand’s second -largest landowner we are actively thinking about using our land to plant forests.